Helicopters are the quickest way of getting into the Himalayan Shangri La. 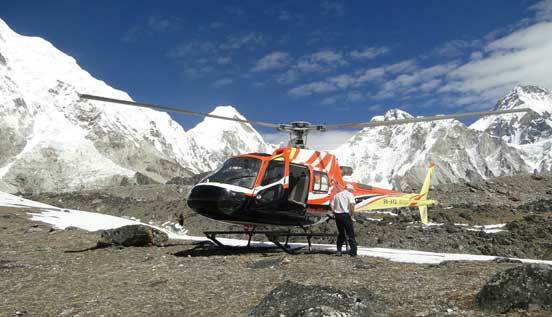 It is popular in Nepal to charter Helicopter to base camps of Everest, Annapurna, Langtang and other Himalayan peaks. Helicopter also shortens trek by cutting off the tedious drive and ups and downs of Himalayan foothills. The Himalayan sightseeing helicopter flight is the best way of experiencing Mt. Everest for those short of time. The 4 hrs helicopter flight will take you to Everest Base Camp or Kalapatter (5,550 m). Our local pilots have great passion and knowledge of the Himalayas to make your flight smooth and spectacular. As you Helicopter lifts in the sky of Kathmandu, Himalayan peaks of Langtang and Gaurishankar starts to arise. The helicopter propels along the Himalayan ranges of Jugal Himal, Rolwaling and Khumbu Himal to arrive at Lukla airport. From Lukla the helicopter follows the narrow valley wedged between Dudh kunda Himal and Khumbu Himal, up north towards Everest Base Camp. Helicopter will either land at Everest Base Camp (5,300 m) or on Kalapatter giving you ample time to take picture fo Khumbu icefall, Mt. 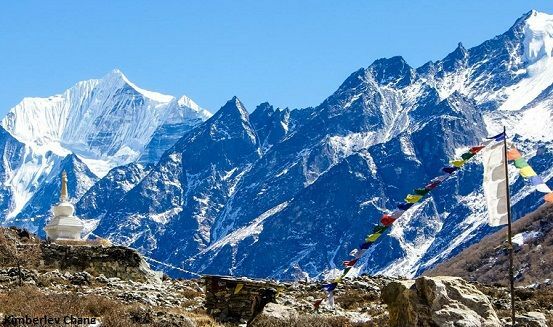 Everest, Lhotse and other spectacular peaks of Khumbu Himalayan range. Hotel Everest View is popular all over the world for its majestic location and panoramic view of the Mt. Everest. The elevation of the hotel is listed at 13,000 feet by the Guiness Book or World Records, and is recorded as the world's highest altitude hotel. Helicopter tour makes it possible to visit of Himalayan hidden valleys within a day. 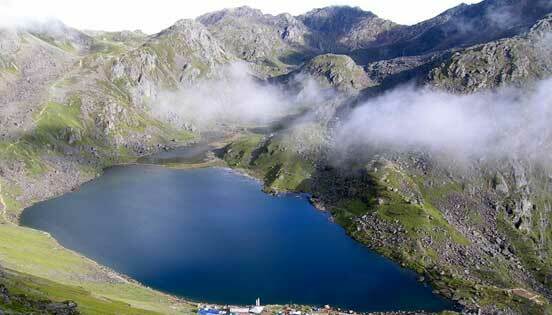 Langtang National Park is one of the famous destination for Himalayan heli tour in Nepal. Helicopter takes you to the alpine meadows of the Himalayas where strenuous ups and downs ends and beautiful Himalayan Buddhist villages thrives. Langtang is right north of Kathmandu, close to Tibet. People living here are Sherpas, descendant from Eastern Tibet and are strictly Tibetan Buddhists. We will fly into the valley and stop for refreshment in Kynjin Gompa before flying out to Kathmandu. Godaikunda at 4,380 m north of Kathmandu is another short Helicopter tour of the Himalayas north of Kathmandu. Gosaikunda is alpine lake with high spiritual significience overlooking at the majestic snow peaks of Ganesh Himal and Langtang range.